Empathy is the word for this month. I had the privilege of graphic recording for a staff retreat. It’s the beginning of the school year, and the staff wanted to do some team building exercises and set goals for the coming academic year. The delivery team designed many hands on exercises to keep all the participants involved. It was an energetic class. The Build Me a Chair exercise was really fun. With Play Dough, Aluminum foil and popsicle sticks, each team was assigned a character from the Simpsons. 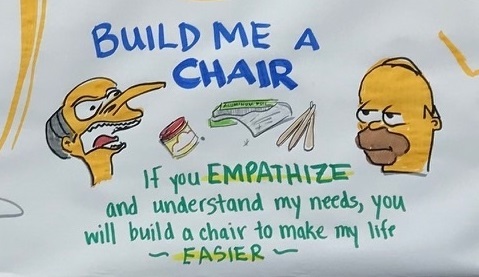 Using materials provided and the description of one Simpson character, each team needed to custom build a chair. If you are familiar with the Simpson show, the characters are quite diverse and they have distinct personalities. The underlying goal was to send a message – always use empathy when dealing with people. Students. Everyone has different needs, and to be empathetic will help create solutions to help make the lives of others easier. This clip from the big map shows Mr. Burns and Homer himself. How would you build their chairs? If I’m remembering correctly, Homer’s chair was built from a foundation of donuts! To see the full map, check out the Portfolio tab in our website. It’s really a dynamic experience to use live graphic recording in a retreat or goal setting meeting. The group will post this map in a highly trafficked area. They will see it daily and throughout the school year will remember the lessons and goals they set on this day. Think about your needs and the needs of your team. Can we help make your goals setting sessions or retreats a fun experience and make it easier to remember the group ideas? Think about the end of the year. Many teams are planning for goal setting exercises. Let us help make it a memorable experience! Need some help planning your staff retreat? Contact me, let’s talk!